“Forests, Farmers, Flavors” are more than just words for LAFAZA. Sourced from one of the remotest places on earth, they work with farmers to produce high-quality vanilla and tropical spices. It all started about a decade ago, when co-founder, husband/wife, Nathaniel Delfield and Sarah Osterhoudt, joined the Peace Corp. They were placed in Madagascar, one of the poorest areas in the world. Vanilla and clove growers had no money, education, or a way to get their most valuable commodities to market. Cut off from the rest of the world and with the closest phone service 200 miles away, these farmers reached out to the Peace Corp for assistance. To make matters (even) worse, the vanilla market prices fell by 90 percent from prior years. Nathaniel and Sarah were amazed by the cultivation, agroforestry systems, and lush landscapes where vanilla beans grow. The name for their company, LAFAZA, comes from the endemic beautiful palm trees that grow alongside vanilla crops. With these raw materials, Nathaniel and Sarah worked with the farmers on planting trees for biodiversity, propagation, food security, agroforestry, conservation, animal habitat, water filtration, soil regeneration, and overall better farming practices. The whole LAFAZA team has lived alongside Madagascar workers, speaking the language, and innovating new supply chains for these spice growers. They are truly passionate about the land, people, and supporting direct trade from farmers associations and cooperatives. By providing training, education, and business skills, LAFAZA aims to heighten the livelihoods of rural communities. The LAFAZA team is dedicated to bringing awareness to consumers of where their food comes from, so that consumers have the power to contribute to a more sustainable and synergistic global community through their purchasing decisions. LAFAZA has recently partnered with Lotus Foods, an exotic rice and ramen company, for their Pink Rice Project. With this joint venture and knowledge of the region, Nathaniel and his team are teaching rice farmers about the system of rice intensification (SRI) in Madagascar, so they can improve rice growing efficiency and environmental conservation. Already exporting 50 tons of Madagascar’s first certified organic rice, these companies intend on reaching 200 tons of exports in 2015. Lotus Foods has been a leader for the last 20 years in educating international rice farmers about sustainability in order to bring rice product diversity to the United States marketplace. Caryl and Ken were itching to start an entrepreneurial business two decades ago. On a trip through China, they encountered 27 indigenous tribes. While staying with the Dai people in Southwest China, they were served steaming bowls of black rice, which grabbed Caryl and Ken’s attention because of its unique, nutty flavor. The next day at the rural market, they spoke with a purveyor who explained that black rice is an ancient grain tracing back to the old emperors; the emperors believed it was the key to longevity because it was a blood tonifier and high in chi. This “Forbidden Rice” spawned what later became Lotus Foods. Caryl and Ken made it their objective and passion to export these unique flavors from Asia and Africa, in order to keep the rich tradition of bio-diverse rice growing alive in remote regions. As a result, Lotus Foods contributed to expanding our palette for rice in the United States. Through their travels, they learned that every village they visited has historical roots tied to heirloom rices, which have been apart of these communities for generations. They also discovered that over 100,000 varieties of rice are lost every year. At the time, Caryl and Ken were shocked that these family farms were earning less than a $1 per day. About 10 years ago, they began working with Cornell University when Lotus Foods was changing to source from conventional farms to organic. After seeing Cornell’s studies of improved rice practices through rice intensification, Lotus Foods adopted this system to educate their network of small farmers about sustainable farming methods. As Caryl explained, “Rice survives in water but does not thrive in it”. The system of rice intensification (SRI) involves using 50% less water, 90% less seeds at a younger age, no agrichemicals, spacing out crops, which reaps two to three times more rice yields for farmers. Lotus Foods has dubbed this program more “crop per drop.” Through this practice, farmers no longer have to flood their fields to eliminate invasive species, therefore putting more value into water conservation. Through Lotus Foods’ partnership with Cornell University and various NGOs, they have seen an impressive growth of rice with over 50 countries and 10 million farmers using SRI. This is up from 40 countries and 1.5 million farmers less than 10 years ago. For Lotus Foods, the work they do is gratifying, and that is why 20 years feels like only the beginning. Their current network of rice farmers are in Thailand, Cambodia, Indonesia, China, and Madagascar, but they look forward to expanding into more developing countries to implement sustainable rice growing methods. Because of these efforts, farmer are now able to send their kids to school, afford a home, and pay for enough food to feed their families. Over the last few years, Lotus Foods was fortunate enough to introduce nutrient-rich and exotic rice ramen to the American market, to provide customers with a healthier alternative for making ramen. They hope to continue discovering new rice products to inspire customers to eat diversely and make an impact with social, economic, and environmental changes for rice producers. From faraway farms, to our kitchen tables, LAFAZA and Lotus Foods have built innovative processes and methods that have improved the quality of farm and family life in the rural villages of the Far East and Madagascar. Greater good(s) and sustainable practices by these two companies have enhanced our access to a diversity of flavors and healthier, unique foods from unknown regions. Next week, the final and 3rd blog, is how the locals (San Francisco Bay Area food companies) are giving American consumers something healthy to snack on. Read our first blog on Dairy Good Practices of our 3-part series. 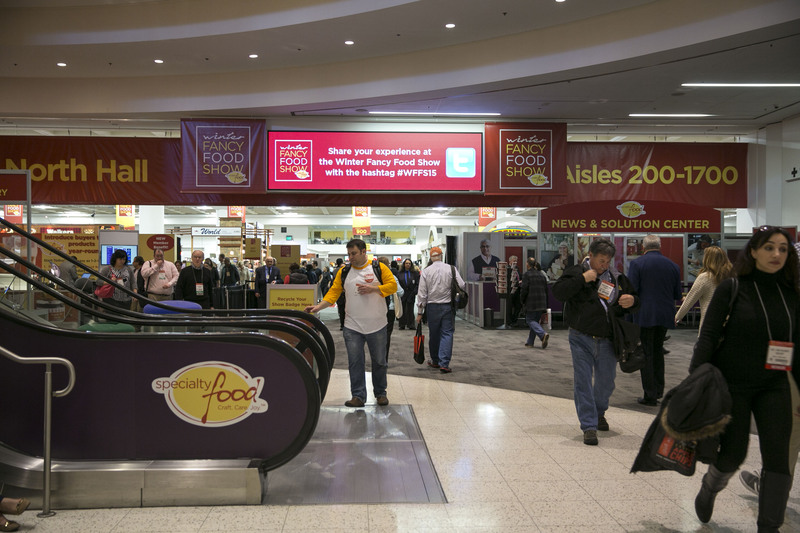 See our Pinterest Board for more micro-blog stories on food companies at the Fancy Food Show.